410 pages | 51 B/W Illus. 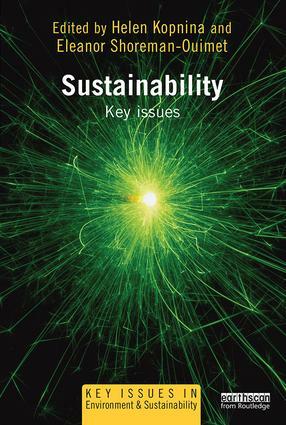 This is the ideal book for students and anyone interested in understanding the key issues within sustainability and how they interact. Helen Kopnina is currently employed at The Hague University of Applied Science in the Netherlands. She is a coordinator of Sustainable Business program, lecturer in Politics, Business and Environment and researcher of environmental education and environmental social sciences. This series provides comprehensive, original and accessible texts on the core topics in environment and sustainability. The texts take an interdisciplinary and international approach to the key issues in this field. Please get in touch with Rebecca Brennan (rebecca.brennan@tandf.co.uk), Annabelle Harris (annabelle.harris@tandf.co.uk) or Hannah Ferguson (hannah.ferguson@tandf.co.uk) if you would like to submit a proposal.